On September 6, 1967 the much needed middle school, Hudson Memorial School, was opened under the leadership of Principal James Tierney. With this facility a comprehensive educational program geared towards the middle school grades would provide transition from elementary grades to high achool. The total school enrollment that year was 2,177; 582 students attending grades 6-8 at Memorial, 721 in grades 1-5 attending H.O. Smith and Webster; 874 attending Alvirne. In addition to the core subjects the curriculum would include music (vocal and instrumental), remedial reading, science, library, foreign language, industrial arts, home economics, guidance, and physical education. This facility would be amongst the best in the state. Hudson Memorial provided a permanent home for the Junior High pupils of Hudson. Prior to 1951 grades 7 and 8 attended Hudson Junior High at the corner of School and First Streets. Once Alvirne was completed In 1951 they attended that school along with the Senior High. at which time the Junior High was changed to an elementary school and renamed The H.O. Smith Elementary School. As school enrollment increased and the H.O. Smith Annex completed these graded were moved to the Annex. With further increases in enrollment and the building of an addition to Alvirne in 1965 the 7 and 8th grades were returned to Alvirne. This was considered a stop-gap measure until the construction of a new middle school. Before the 1965 School District meeting the School Boad obtained educational specifications for an upper elementary building, formed a study group of lay citizens to work with them to determine the needs, possible site selection, and building requirements. The architectural firm of Irving W. Hersey was utilized for preliminary drawings and plans. This information was presented to the voters in preparation for the meeting. Voters approved $1,000,000 bonding for the construction of this school with the understanding that a public hearing is held once a site is selected and detailed plans in place but before project is put out for bid. In 1966 approximately 22 acres was purchased between Central Street and Thorning Road from Earl C. and May Mizo and John Powlowski and a construction contract was signed with Davidson Construction of Hookset. The projected completion was for the spring 1967 and ready for use by September 1967. Completion date was met but the voters were presented with an overage because of some contractual issues and problems with the grading and paving. At the dedication and open house October 29, 1967 the keys to Hudson Memorial School were presented by the architectural firm to Leonard A. Smith, Chairman of the Building Committee and Donald C. Shepard, Chairman of the School Board. Other members of the building committee were Royce Albee (deceased), Roger M. Boucher, Vincent F. Braccio, Paul W. Buxton, Maurice R. French, Joseph Gonda, Paul E. LeClair (also on School Board), and Philip G. Rodgers. Other members of the school board were Leo N. Bernard, John P. Lawrence, and William Roberts. This day in October 1967 there was a double dedication. The gymnasium of the new middle school was dedicated to the memory of SP4 Leonard Nute, a Hudson serviceman killed in Vietman on May 25, 1967. “Lenny” was a 1965 graduate of Alvirne and the first casuality from Hudson in Vietman. A memorial plaque placed outside the main entrance to the gymn was donated by the Hudson Lions Club. Leonard King Nute’s name appears on Panel 20E Line 105 of the Vietnese Wall in Washington, DC. Each year before Memorial Day, Hudson Memorial School honors “Lenny” Nute with members of the Nute family in attendance, particularly older brother Gene Nute. May of 2017 was different. This was the 50th anniversary of Hudson Memorial School and it was likely the last such ceremony that brother Gene, or a member of the Nute family would be able to attend. School enrollment continued to increase after the school year 1967-68. At the School District meeting in March 1969 voters were asked to approve the construction of an addition. After an extended meeting this was approved at a cost of $744,000. Shortly after this meeting a contract was signed with Davidson Construction Company to provide complete services for the building addition. Ground breaking occurred in April with a completion date of February 1970, with a hope that several classrooms would be available by September 1969. A shortage of mason workers slowed the progress. As September 1969 approached it became obvious that these classrooms would not be available by September. A decision was made to partition the gym into 6 classrooms, the library into 2, and to use a large storage area as an additional room. With these 9 temporary classrooms the school year 1969-70 began. By the following school year construction was completed and the library, gym, and storage space returned to their intended purposes. As we fast forward to 2019 the curriculum at Hudson Memorial has expanded to include music (a jazz band, chorus, and general music), drama, art, health, computers, technology, as well and family and consumer science. Within the sports department students can participate in interscholastic soccer, cross-country, basketball, wrestling, baseball, softball, and volleyball. Construction of a 400 pupil high school on Hills estate began in October 1949 with up to $350,000 from the estates of Alfred K. Hills and Mary F. Creutzborg, the mother of Ida Virginia Hills set aside or that purpose. Alvirne was opened September 1950 as a combined Junior and Senior High School. Course of study included college preparatory, commercial, domestic science, shop, and agricultural courses. The vision of Dr. Hills which began in the 1920’s became a reality in November 1950 when Alvirne High School was dedicated and the keys presented by the chairman of the Building Committee, Eugene Leslie, to Dr. John Quigley, chairman of the Hudson School Board. During an open house over 1,000 people toured the new school. As a part of these ceremonies a scroll of appreciation was presented to Jesse Norwell Hills by members of the School Board for her invaluable service in helping to make possible the wishes of Dr. Hills and Mrs Creutzborg. On June 14, 1951 the auditorium of Alvirne was filled with friends and family of 25 seniors, the first graduating class of Alvirne High School. They entered to the processional, “Pomp and Circumstance” wearing the traditional maroon cap and gown. The diplomas were presented alphabetically by Henry Hastings, Superintendent of Schools. So the very first diploma issued from Alvirne High School was presented to George W. Abbott. These diplomas were a metal certificate mounted onto a wooden board as shown in the accompanying photo. On behalf of the senior class, John Simo presented a corsage to Jesse Norwell Hills. During this first year many gifts were made to Alvirne. Among them the framed and lighted picture of Dr. Hills for the school lobby, presented by his widow, Jesse Norwell Hills. The School Board noted in their annual report that the per student cost to the taxpayer to send a student to Alvirne was $200 vs the tuition cost of $253 to Nashua. That year there were 764 students enrolled in Hudson schools; 308 of these attending Junior-Senior high school at Alvirne. In the next few years continuous improvements were made to the programs and curriculum at Alvirne, particularly in the area of vocational agriculture (Voc-Ag). The Trustees set aside money to help with the farm. To assist the School Board with opportunities arising from operating of a farm, an Advisory Committee consisting of local farmers, Earnest Chalifoux, Robert Jasper, Albert Kashulines, and Henry Smith was put in place. One of their recommendations was to change from a beef herd to a dairy herd. The beef critters were sold and equipment changed to the needs of a dairy herd. A milking parlor and milk room were added. A fine herd of milkers was put in place and a silo added to the barn. By 1957 Alvirne was accepted as an area Vocational Agricultural School. As the educational opportunities at Alvirne increased so did the enrollment. This increase was due to the population increase in Hudson as well as neighboring towns who did not have their own high school and opted to send their students to Alvirne on a tuition basis. At the school district meeting of 1958 voters agreed to proceed with an 8 room addition to Alvirne. The firm of Irving W. Hersey Associates was again hired as architects. This addition was added to the south end of the building with a new combination cafeteria/auditorium in the basement. Plans also included the construction of a stand alone Voc-Ag building between the north end of the existing building and the farm. The expenditure of $182,850 for the school addition and $33,150 for the Voc-Ag building were approved at the school meeting held in March 1959. Based upon enrollments this addition would be needed by September 1960 and was expected to meet student needs for the next 5 years. Sepalla & Aho Construction Company was contracted for this project. and the new addition available September 1960. By the school year ending 1963 the student population of Hudson continued to grown as did the population in neighboring towns including Pelham, Windham, Londonderry, and Litchfield. Alvirne was accepting tuition students from each of these towns. It became apparent that additional high school space would again be needed by September 1965. At the 1964 School District meeting the School Broad was authorized to negotiate a long term contract with Pelham for their tuition students. At the same meeting voters approved the design, construction, and equipment of a 16 room addition to Alvirne. Final approval of this $500,000 addition came at a special meeting in July 1964. The addition would be to the north end of then existing building. In order to alleviate overcrowding at Alvirne a quarterly program was suggested by then Principal Chester Steckeviczl thus using the school facilities year round. This plan was put into place by the school year 1970-71, The community was saddened in June 1972 when just days before the graduation, Cheste Steckevicz passed away of a heart attack after serving as principal of Alvirne for 15 years. Robert Bettencourt, then principal at Memorial School filled the vacancy. 1973 was a banner year for Alvirne. A new greenhouse for the Vo-Ag was completed. Alvirne was evaluated under the quarter plan and granted full re-accreditation. There were 223 seniors graduating and we had a championship soccer team! However, September 1974 the school year began in tragedy when, just 2 days after the beginning of the school year, Alvirne was 80% destroyed by fire. Upon arrival at the high school Deputy Fire Chief Robert Buxton saw that the gymnasium-auditorium and the center of the school were totally engulfed in flames. Help from other towns under mutual aid arrived within minutes. A mile of hose was used to connect to the nearest hydrant. In addition 6 pieces of apparatus were used to relay and pump water. The farm pond as well as the cistern located on the hill across the street was drained of well over 23,000 gallons of water. Alvirne was destroyed and 1200 students were displaced by the fire. After investigating Fire Chief Frank Nutting disclosed that the blaze had been set. Within a few days and for the next year what resulted was a huge effort on the part of the School Board and many, many volunteers within town. To continue the class requirements the then empty St. Francis Exavier school building in Nashua was leased for the year and students for Grades 4 and 5 were bused to Nashua where they were taught by their regular teachers. Dual sessions were held at Memorial for grades 7 – 12. This all occurred within a two week period. Volunteers worked to salvage books, desks, etc. Other items were borrowed from neighboring school districts. At a special school district meeting in November 1974 the school district voted to rebuild Alvirne at a cost of $4.3 million or $28.16 per square foot. Cost was covered by the insurance money, money from Alvirne Trustees, and a 2 million bond issue. By September 9, 1975 one year and one day after the fire, Alvirne was again in session in a new building located at the old historic site. This week we return to the early 1940’s and visit the house known as “The Bee Hive” located on what is now 73 Central Street near Hammond Park. I am not exactly how this house acquired it’s nickname. Perhaps it was used as apartments (tenements) or maybe even used as an overnight stay by folks taking a free ride on the railroad?? We’ve heard the expression “A picture is worth a thousand words”. That is the case with this early 1940’s photo of the house, known as “the bee hive” located on what is now 73 Central Street; opposite what many remember as the home of Leon and Gerri Hammond. To the right and slightly behind this house we see two homes; the right most of these is located at 65 Central Street, home to Henry Frenette. The second, smaller home, is at 1 Lowell Road and home to Alfred Bastien. A few first hand memories have been documented about the “bee hive”. The first is from Maurice “Nick” Connell who grew up in Hudson and later recorded some of his memories via a series of occasional articles in The Hudson News. In one such article (August 24, 1984) “Nick” recalls the “going’ swimmin'” routine of his gang of friends in the 1930’s. They would swim and dive in the Merrimack River near the railroad bridge abutments; then walk the tracks to the Lowell Road underpass and explore the “old haunted house” on Central Street near the overpass. He remembered this two storied, weather beaten structure also known as the “bee hive”. This nickname was applied to the house because of the strange and shady goings on there. This reputation added to the excitement of the barefoot summertime explorations of a group of young boys. They would walk the tracks to Melendy Pond, another popular “swimmin hole”. According to Nick, this house was torched by some unnown arsonist on November 1, 1945 and torn down on November 27, 1945. Another memory of this house was left by Leo J. Gagnon. He recalled Anton’s restaurant and their parking area on the opposite side of Central Street – where a house called the ‘bee hive” once existed. By his memory this house was a half-way house. Other memories I have heard suggest it was a frequent and convenient “overnight” stop for individuals catching a free ride on the train as it passed through Hudson then on to West Windham, and Rochester, NH. Speaking of the railroad, the second photo shows a portion of the Hudson zoning map for 1942 from the Hudson Town Report. This map traces the route of the steam railroad from the river to the overpass at Lowell Road where the tracks crossed over Lowell Road and ran behind the ‘bee hive” house and continued on to Melendy Road, “Long crossing” and Hudson Center. A few additional details are known about this house. According to the town report for 1947, the Walton land on which was situated the so called “bee hive” was purchased (at least in part) by the Town of Hudson from the State of NH. By 1870, and possibly before, this house was home to Samuel Walton, (age 49), his wife Fanny (age 48), and their daughter Sarah (age 21) and son James (age 19). Samuel was born about 1817 in England and was employed in a shingle mill. Based upon census records Samuel lived here until his death in February 1892, at which time the home was passed to his daughter, Susan (Walton) Brown, and his son, James Walton. His wife, Fanny had predeceased him by a year. At the time of his death he had an ownership interest in the Melendy Mills. 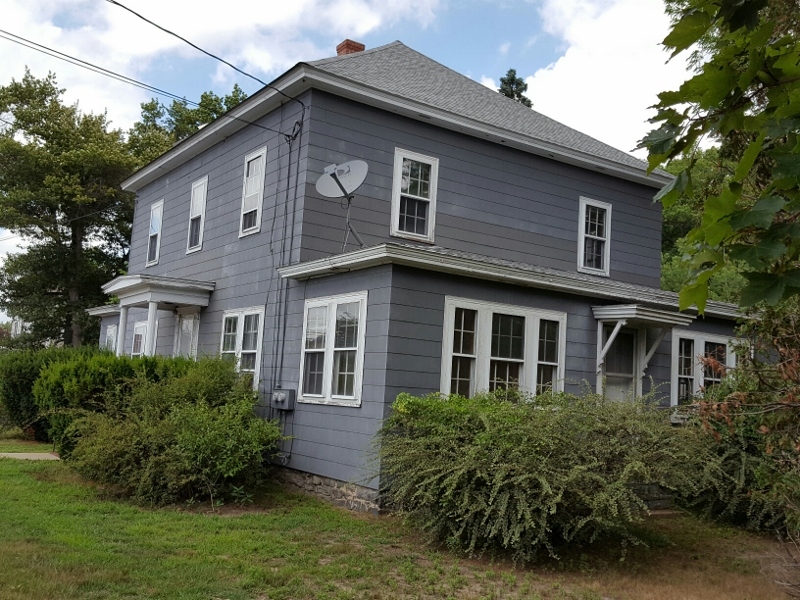 With Central Street in your front yard and the railroad tracks in your back yard, the lot upon which this house existed was likely reduced in size and attraction through the years. 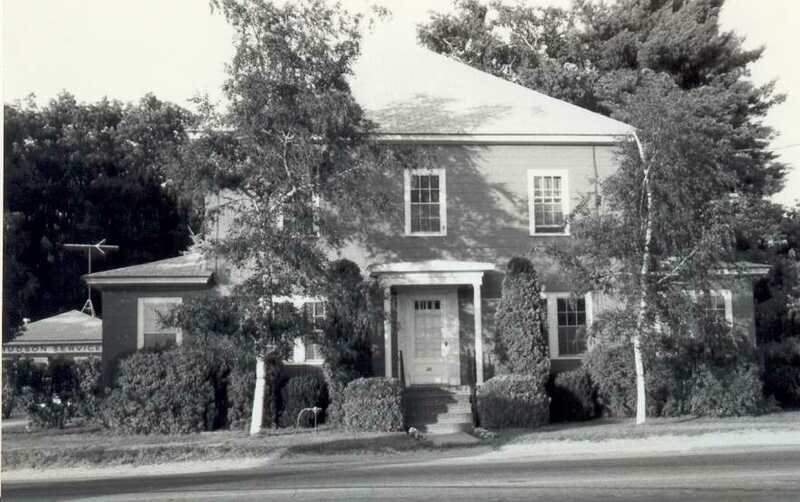 By 1897, Susan and James sold the house to William Fitzgerald of Nashua. Samuel Walton purchased the property from Joseph Fuller and Fred Steele in 1868. After being sold by members of the Walton Family this house had a variety of owners, tax issues, and foreclosures. In February 1999 in an effort to remember those fire fighters who had fought and those who have fallen the Hudson Fire Department announced they were seeking to build a new and larger memorial. A modest memorial for fallen firefighter James Taylor did exist in front of the Library Street Station. Their plan was for a larger memorial which would be dedicated to all men and women of the Hudson Fire Department. A Memorial Committee, chaired by David Moran was organized and they proceeded to design and raise funds for such a memorial. The committee reached out to town and school officials for a suitable location. A number of sites were considered and by April 2000, their plans had cleared the final hurdle. Ground breaking began and by May 21, 2000 the Hudson Fireman’s Memorial was dedicated upon a grassy knoll at the intersection of Central Street and Lowell Road. The location of this memorial has been named Hammond Park in memory of firefighter and neighbor Leon Hammond. Hammond Park and the fireman’s memorial is located upon or near the site of the Samuel Walton home, more recently known as the “bee hive”. The vision for Alvirne High School began with Dr. Alfred K. Hills and was set in motion by his last will and testament written in December 1918, less than two years before his death in May 1920. However, there were two pivotal events in 1948 which, in the final analysis, permitted the Town of Hudson to establish Alvirne High School on the former Hills Estate on Derry Road. The first of these was the legendary Alvirne Summer School which took place at the Alvirne Summer Home and the surrounding field and forest; the purpose being to show that a high school which satisfied the conditions of Dr. Hills’ will was feasable in Hudson. This school was established by town and school officials upon the suggestion of Attorney Robert B. Hamblett, representing the estate of Dr. Hills. The second, and less public event, was the role played by Mrs. Alfred Hills (Jesse) in the final negotiations and litigation of the estates of Dr. Hills and his mother-in-law Mary Creutzborg. First some background. Alfred K. Hills was a Hudson native, born October 1840 on the farm of his Hills ancestors. By the age of 22 Alfred had graduated from Harvard College and by age 25 had married Martha Simmond in Boston. In the years to follow he studied medicine and established his 40 year medical profession in New York City. In 1885 his wife Martha passed away after 20 years of marriage. In 1887 Alfred married Ida Virginia Creutzborg of Philadelphia and they purchased the old homestead and acreage on Derry Road. In 1890 they built their “Alvirne” summer home in a field across the road from the farmhouse. Alfred and Virginia had two daughters; Gladys born 1891 and Mary born 1895. Both children died in infancy. In May 1908 Ida Virginia passed away suddenly. The generousity of the Hills/Creutzborg family to our town is well known. Alfred and Ida Virginia donated a bell and belfrey for the Chapel of the Holy Angels on Lowell Road. Soon after Ida Virginia’s death in 1908 he built the Alvirne Memorial Chapel in her memory. Alfred and his mother-in-law Mary Creutzborg provided the funding for the Hills Memorial Library and for Library Park. In 1910 Alfred Hills and Jessie Norwell of Nashua were married. When Dr. Hills passed in May 1920 he was interred within the Alvirne Chapel along side his wife Virginia and their daughters. In his will Dr. Hills left lifetime income to a number of beneficiaries with the remainder of his estate to the Town of Hudson for the purpose of establishing an “industrial school” containing the name Alvirne. In May 1928 Mary Creutzborg passed at the age of 102. By her will she also provided funding for the Alvirne school envisioned by her son-in-law Alfred. In the 19 years which followed no funds from either estate were made available to Hudson. During this time the beneficiaries were being paid, the Hills farm continued operation by a farm manager, our country was in a depression, the intent of an “industrial school” was unclear and the wills were being contested in the courts by family members. In August 1947 the court did rule that the trust money could be used by Hudson. The problems were the appeal of this decision and a continuing battle with some of the heirs to retain a percentage of the money. This brings us up to the spring/summer of 1948. Local school officials, attorneys for the Town of Hudson and the Hills Estate organized a school to be known as Alvirne High School on June 7, 1948 at 4:00 pm at the Hills summer home. There was a public gathering including parents, school and town officials and some 22 girls and 10 boys who registered classes. Mrs. Harold (Maude) French, a local 4-H leader, was designated to teach sewing to the girls. By the end of the session these girls learned basic sewing techniques and had made 12 playsuits, 15 dresses, 20 shorts and pedal-pushers, 9 blouses, and had remodeled several garments. Kenneth Gibbs who had recently retired as county 4-H agent was designated to teach a session for the boys; including foresty, soil testing, basic dairy and barn maintenance as well poultry raising. Mr. Gibbs served as the first principal of Alvirne. In the end this summer program lasted 6 weeks with diplomas issued at a closing graduation. The first photo was taken June 1948 in the Library of the Alvirne Summer Home during one of Jesse Hills’ visits to the school. These sessions and activities of the summer school were watched by several individuals including lawyers representing various parties. The lawyers for the heirs were hoping to show that the conditions of the will had not been met. Following the graduation several individuals, including Mrs. French, Jesse Norwell Hills, Principal Gibbs, and members of the school board, were served court summons to give depositions to prove that the legal requirements of the will were met and that the school was established. Testimonies were made before 6 lawyers; 4 representing the heirs and 2 defending Alvirne. Mrs. French was questioned for a period of 2 hours. Even when word came that the conditions of the will were met the appeal process and litigations continued. As late as January 1949 there were prospects of further costly litigation and appeals. In an effort the ‘buy peace’ with the family and proceed with the design and building of a high school a settlement was negotiated for $25,000. The school board, Mrs. Hills as trustee of the estates, and their councils agreed. Following this decision Architect Irving Hersey and Trustees of the Alvirne School worked on plans and drawings for Alvirne High School. Ground breaking was scheduled for the spring 1949. Our second photo shows the architect’s drawing of Alvirne High School from the cover of the first school yearbook entitled “SATYR” in June 1951.